It is proposed a procedure of discrete orthogonal transformation, where the first transform coincides with reference signal. There are represented application of normal conversion for researched signals classification. V. G. Abakumov, O. I. Rybin, and Y. Svyatash, Biometrical Signals, Genesis, Processing, Monitoring (Nora-Print, Kyiv, 2001) [in Ukrainian]. I. Yan, “Non-linear Matched Filtering for Differences Analysis,” Izv. Vyssh. Uchebn. Zaved., Radioelektron. 42(6), 51 (1999); Radioelectron. Commun. Syst. 42(6), 43 (1999). 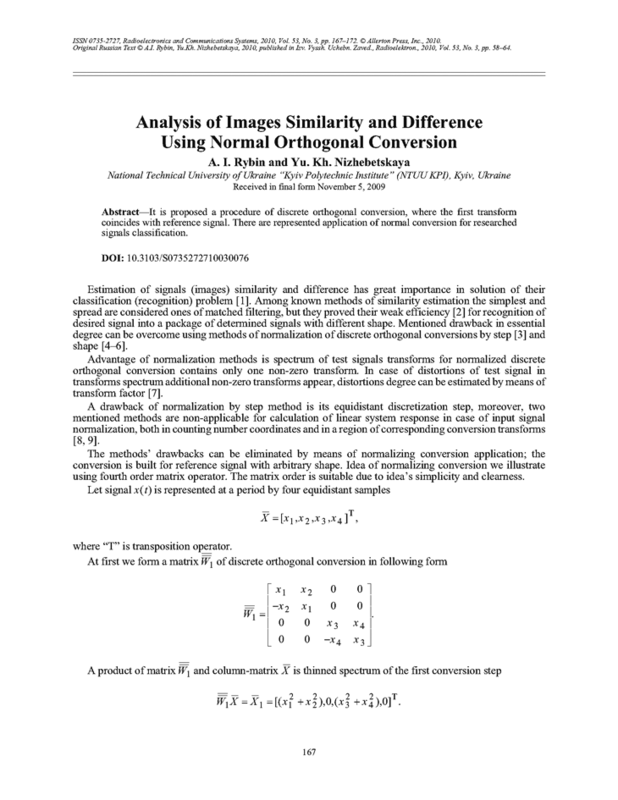 A. I. Rybin, “Normalization of Discrete Orthogonal Conversion by Test Signal,” Izv. Vyssh. Uchebn. Zaved., Radioelektron. 47(7), 39 (2004); Radioelectron. Commun. Syst. 47(7), 30 (2004). A. D. Melnyk and A. I. Rybin, “Normalization of a reference signal with constant quantization step,” Izv. Vyssh. Uchebn. Zaved., Radioelektron. 51(1), 71 (2008) [Radioelectron. Commun. Syst. 51(1), 50 (2008)]. A. I. Rybin and A. D. Melnyk, “Matched normalized signal filtering,” Izv. Vyssh. Uchebn. Zaved., Radioelektron. 51(2), 77 (2008) [Radioelectron. Commun. Syst. 51(2), 112 (2008)]. A. D. Melnyk and A. I. Rybin, “Matched wavelet filtering of signals with change scale,” Izv. Vyssh. Uchebn. Zaved., Radioelektron. 51(3), 76 (2008) [Radioelectron. Commun. Syst. 51(3), 173 (2008)]. Yu. Kh. Nizhebetska, O. I. Rybin, A. P. Tkachuk, and O. B. Sharpan, “Normal Discrete Conversion of Arbitrary Shape Signal,” Naukovi Visti NTUU KPI, No. 4, 34 (2008). A. I. Rybin and A. P. Tkachuk, “The Analysis of Linear Systems in the Field of Transforms and Intrinsic Frequencies of RTF Transformation,” Izv. Vyssh. Uchebn. Zaved., Radioelektron. 49(11), 56 (2006); Radioelectron. Commun. Syst. 49(11), 39 (2006). Yu. Kh. Nizhebetska, O. I. Rybin, and O. B. Sharpan, “Increase of Accuracy of Orthogonal Conversions for Linear Systems Analysis,” Naukovi Visti NTUU KPI, No. 5, 12 (2008). O. I. Rybin and Yu. Kh. Nizhebetska, “Algorithm for Shape of Matrix Operator of Discrete Normal Conversion,” Visnyk NTUU KPI. Ser. Radiotekhnika. Radioaparatobuduvannya, No. 37, 19 (2008). V. Taranenko, Hidden Psychodynamics in Practical Report. Handwriting, Portrait, Character (Kiev, 2001) [in Russian].